The old town of Michelstadt in Germany is nicely decorated all through the christmas season with lights and novelty scenes. But only between christmas and new years eve all the boothes of the christmas market are gone and the town shows its real quiet beauty. 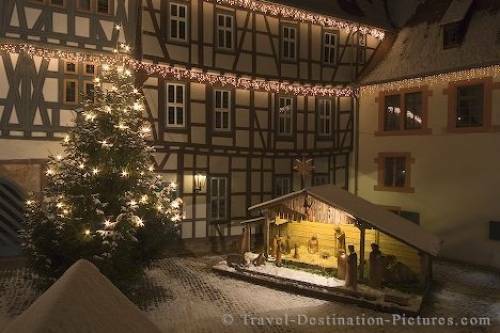 Picture of a novelty scene surrounded by Christmas Lights in the town of Michelstadt, Germany.